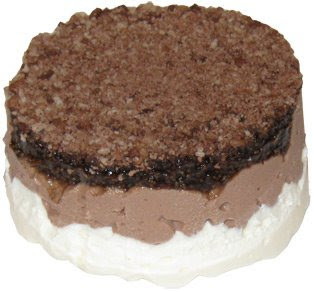 You know what I love about Tiramisu? It's awesome, plain and simple. I can still remember the first time I had it actually. We were at a really nice restaurant and someone said I had to try the Tiramisu. The waitress brought out a giant square piece of Tiramisu and I enjoyed every bite. I've had it a few times since then and it's always a pleasant experience (though never quite as good). I'm guessing (hoping) you've had the same kind of experience. 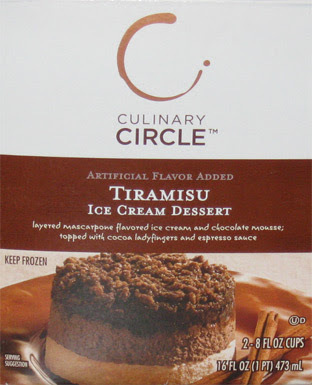 Culinary Circle is looking to cash in on those tasty memories with their tasty looking treat simply called "Tiramisu". All the other ice cream desserts have long names, but not this one. 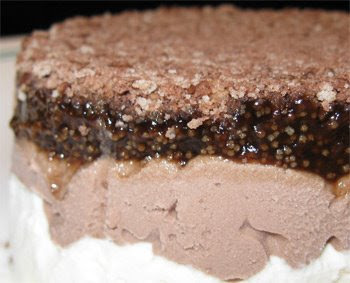 Actually, once you see the word "Tiramisu" on the box, you may not even bother to read the exact description: "layered mascarpone flavored ice cream and chocolate mousse; topped with cocoa ladyfingers and espresso sauce". Hmmm, espresso sauce sounds....well, I'm a little scared. 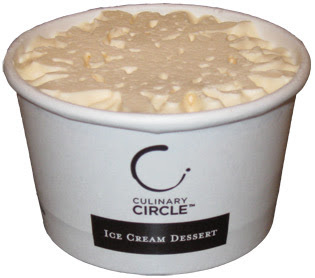 The mascarpone ice cream has a light yellow color and not too much of a smell, maybe just a hint of a buttery whiff, but that's it. Side note: this flavor manages to have half the saturated fat of all the other varieties, though I'm not really sure why. I flip my little friend over and start to get the scent of coffee. It's been a while since I had Tiramisu, but I don't remember that smell. The sauce looks a little strange, let's zoom in and see what's up. Now that's funky, the ladyfinger bits are floating in the sauce, well, technically it looks more like gel than a sauce. Ok, I can't wait any longer, time to dig in! and ...it's ...strong ...really really strong with the espresso flavor. Oh no, I don't like this at all. In my defense, or maybe in the dessert's defense, I don't drink coffee -ever- Technically it is 5AM ...and I once ate a coffee bean just for the heck of it, but I still have no urge to enjoy this treat. I try scooping less sauce and more ice cream, but it's still too strong. There's no need to waste, so I ate the ice cream and mousse underneath and left myself with a pile of sauce. The mascarpone ice cream actually has a buttery taste to it ....oh, that's because mascarpone is a triple-cream cheese and can be used in place of butter - that would explain that. I ate some of the ladyfinger crumbs on top, but i couldn't salvage very many of them. It's hard to say what they taste like because the espresso sauce overpowers them. Like I said, I've had Tiramisu quite a few times but I don't remember ever being bothered by the espresso part. I can only recommend this for coffee lovers out there. I guess I finally found one of these treats that I really don't like. On Second Scoop: In an attempt to mix things up, I tried eating the second cup upside down (or would it be wrong side up). First I took a few bites of just the ice cream: Way too buttery. Nothing wrong with a hint of butter, but this is like eating butter. I try a few bites of just the chocolate mousse: nope, not working for me at the moment. Ok, tried a bite of the whole thing one more time: Sorry, I just don't like it. This one is for coffee lovers only.